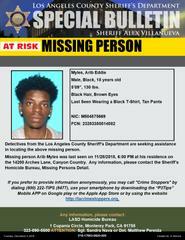 Los Angeles County Sheriff’s Department’s Missing Person Unit investigators are asking for the public’s help in locating At Risk Missing Person Arib Eddie Myles. 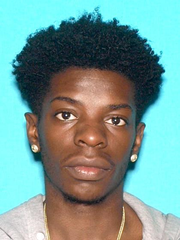 He is an 18 year-old male Black who was last seen at his residence on the 14200 block of Arches Lane, Canyon County on Wednesday, November 28, 2018 at approximately 6:00 p.m. He is described as 5’09” tall, 130lbs., black hair, and brown eyes. He was last seen wearing a black t-shirt, and tan pants. His family has not heard from him and are very worried. They are asking for your help in located him.